I'm standing at the northern end of US-23 in Mackinaw City, at Exit 338 on I-75. This is the last freeway we'll see for 200 miles. We started the morning with breakfast at Audie's. Many tourist places in Mackinaw City date from the early 1960s, as completion of the Mackinac Bridge in late 1957 drew more auto travel here. As we drive through town we'll see the where US-23 ended at a ferry dock before the bridge was built. Audie's has been here since the Mackinac Bridge was built, though it was known ad Downing's Cafe in 1962. It has great breakfasts, so it suits all our purposes. I'm a sucker for corned beef hash for breakfast, so Audie's Heavenly Hash is for me. And it comes with eggs! If you want something for a picnic lunch later, grab one of their homemade breads or some desserts to go. A short drive north off US-23 on Nicolet Avenue brings us to Colonial Michilimackinac State Park. After breakfast I like to stop at the park, to watch some freighters ply the waters. Let's get out and walk down to the gravel beach. The park has been much improved in recent years with a walkway, signs and view scopes, but in 1962 it was just you and the beach. You can look out at the Mackinac Bridge and Michigan's Upper Penninsula from the park, the most northerly point on Michigan's Lower Penninsula. Lake Huron is beside me, one part of the great inland sea known as the Great Lakes. Behind the bridge, in the park, is Fort Michilimackinac, established by the French in 1715 to guard these narrows between Lake Huron and Lake Michigan. A few miles out in the lake to my right is Mackinac Island, one of Michigan's top two travel destinations. You can't take your car onto Mackinac Island, and there are no other cars on the island either. It's still the 1890's out there, where horsepower is king, so they're even farther back in time than we are! Because we're not doing a Roadtrip-1892 ™ , and also because it's beyond our self-imposed five-mile limit from US-23, we're not going out to Mackinac Island. It's well worth seeing if you come up here though, and it was there in 1962. If you go, figure on spending the entire day on the island. 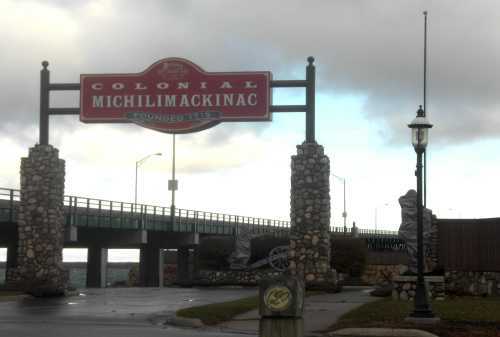 Instead, we're going to walk under the Mackinac Bridge and visit Colonial Michilimackinac. We start at a visitor center, and then walk to the water gate of the fort, as that is where most visitors would have entered back in the 1700s. Though the French built the first fort, we have a reconstruction of the fort during British occupation, as that lasted longer. You can tour at your own pace, and there are daily demonstrations of cannon firing, colonial weddings, military drills and other slices of colonial life. An archaeology dig is often in progress also. The fort was here in 1962, but the demonstrations and some of the reconstructions are more recent, so we see a more complete picture than you would have in 1962. Something else you can still do today that you could do then was to watch the pageant at the fort. Every year, beginning in 1962, the fort has hosted a recreation of the battle between the Native American forces of Chief Pontiac and the British, whereby the British lost control of the fort in 1763. The pageant is held Memorial Day weekend and for times and more information you can check with the Fort Michilimackinac Pageant Committee. After the fort, we exit back to the park and check out the Old Mackinac Point Lighthouse which is now open to the public. It was completed in 1889 and closed in 1957 when the Mackinac Bridge opened. I suppose you don't really need a lighthouse when the bridge is covered with lights at night to show the channel. The Mackinac Island State Park Commission purchased the property in 1960 and added it to the adjacent Michilimackinac State Park that we just visited, so we could have visited during 1962. They spent several years recently repairing and restoring the building, and re-opened it to the public as a museum in 2004. We'll also have a chance to see many more lighthouses along Lake Huron before we head inland. Of course, no trip to Mackinaw City is complete without some shopping, so let's hop in the car and go downtown. Downtown is a single strip, Central Avenue, which has been nicely remodeled in recent years. It was pretty simple in 1962, but has had a lot of new building fronts added over the years. Many of the shops here now are new, but Cunningham's Restaurant, Teysen's Gifts, Alice's Kandy & Korn, Marshall's Fudge, and few others were here in '62, so I'm stopping in to some of these old places before I leave town. Alice's was opened in 1951 by Alice Jones and is reputed to be the first candy shop in Mackinaw City. You can still get anything you really need at the old places like Coffman Hardware. But it's harder to find the stuff you really don't need, as the last of the old style tourist junk stores, the Bargain Barn, is no longer here. The building now houses an arcade and the old style stores have been replaced by upscale souvenier shops in a shopping mall with brand new historical-looking buildings. I've got my fudge for the road now, plain chocolate and old fashioned maple walnut. In 1962 you could only buy about 6 flavors, all the others are newer inventions. I'm almost ready to leave town, but we'll drive by one more historic spot on our way out. On our way back to US-23 at the south edge of town, we pass the old State Ferry Docks, now used by the Mackinac Island ferry companies. There is also a small park here with a historic marker that recalls, "...passengers could wait more than ten hours..." I recall a couple of very long waits for the ferry when I was a kid. The State of Michigan ran the auto and railroad ferry system across the Straits of Mackinac before the Mackinac Bridge was completed in 1957. 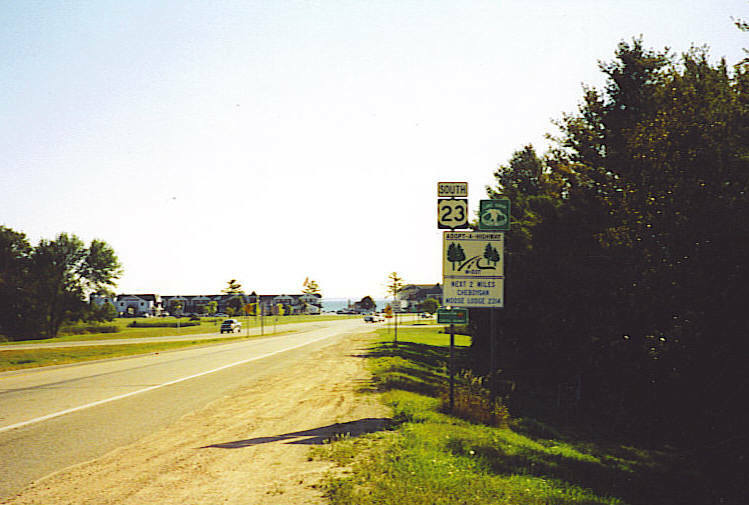 This is where US-23 once began, right at the ferry docks. 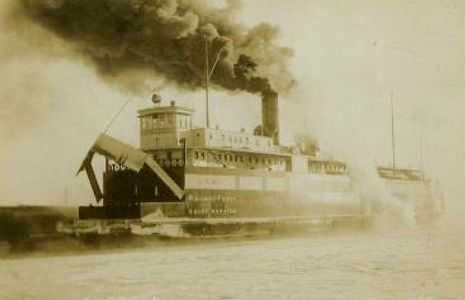 The Chief Wawatam was the boat used from 1911 to 1984, though after 1957 it was used only for the railroad. The Chief had four tracks and even staterooms for passengers. Another ferry, the Sainte Marie (No. 2) was also in use from 1913 to 1961. I believe both ships have been cut up for scrap. Though the ferries are gone, the Coast Guard Cutter 'Mackinaw' is docked here now in retirement. I don't have time to take the tour, but you might if you come and spend a couple days. This icebreaker was built during World War II to keep the Great Lakes open in winter for the movement of iron ore, limestone and coal to the nation's steel mills. It is currently a museum, open for tours from May to September, so you can see this piece of 1962 if you want to stop. The ship has connections to several places we will visit on our trip. While it was working, it was based in Cheboygan, Michigan, which we're on our way to. It would have been visible up and down Lake Huron if we were driving US-23 during winters from 1944 to 2006. And finally, it was built in Toledo, Ohio, where we'll also go. The Mackinaw was the largest United States Coast Guard Cutter on the Great Lakes. Leaving town, many of the motels we are passing are new, but many of the smaller ones date to before 1962. I've stayed at the Northwinds Motel back in the 1990s and found it quite comfortable at that time. All of the chain motels you see here are recent arrivals, especially the multi-story buildings. Other good older motels here include the Econo Lodge (Karl's Cabins back in 1962) next to Audie's Restaurant, which I've also stayed at, and the Wa-Watam, the Vindel, the Sunrise Beach, the Capri Motel, another Econo Lodge which is the cutest little collection of cabins, and part of the Quality Inn. The cabins you see today at the Econo Lodge on Huron St are new replacements for the old ones, so you have the advantage of an old location with new accomodations! Motels were pretty much one story mom-and-pop businesses in 1962, with the exception of Holiday Inns. We may find and stay in an old Holiday Inn building later on the route, though most of them have other names today. Besides the type of building, I've found another way to spot older motels. 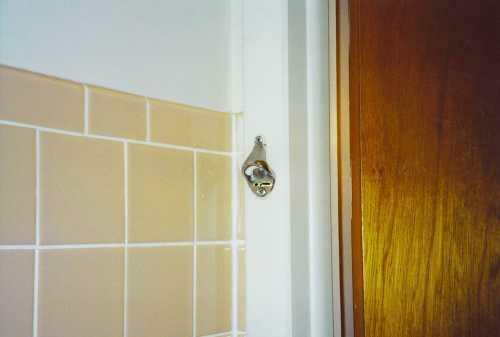 You know your motel room is old when there's a bottle opener on the bathroom wall! The wall-mounted bottle opener is a gadget you almost can't buy any more, but once they were in every motel and gas station because all soda pop was sold in bottles that did not have twist off caps. Finally heading south out of Mackinaw City on US-23 this morning, we pass the Tee Pee Campground, which looks like it may have been here in 1962, but I haven't yet found out. Just 5 miles out of town we come to another historic State Park. This one, Old Mill Creek State Park, was not here in 1962 so we won't be stopping. I suppose in 1962 we could have stopped the car and hiked into the woods to do some amateur archaeology, and maybe we would have found some interesting artifacts. As it happens, three local amateur archaeologists did just that. They discovered the site in 1972 and now the park showcases reconstructed historical structures from the 1790s, with sawmill demonstrations daily. The rest of the drive to Cheboygan is right along Lake Huron, allowing great views of the lake occasionally between cottages. The best place to stop is a roadside park about 10 miles from Mackinaw City, on Point Nipigon. You can still usually get one last view of the Mackinac Bridge. You might even be able to watch some lake freighters passing by. Ocean-going ships also use the Great Lakes, so if you're a shipping buff, keep watching. That's why I call this trip "From sea to inland sea. "; because the Great Lakes are just like another ocean at this end, and the other end of US-23 in Florida is near the Atlantic Ocean. The reason ocean-going ships can get into the Great Lakes is the construction of the St. Lawrence Seaway. This is a system of lakes, rivers, deepened channels, locks, and canals completed in 1959. The biggest obstacle to commerce was Niagara Falls, but now, and in 1962, you can come from the Atlantic Ocean 2,340 miles inland all the way to Duluth, Minnesota. Cheboygan, Michigan is an old lumbering town, now become mostly a tourist town. Somewhere in town, at least a few years back, there was the world's largest sawdust pile, at Watermill Field. I haven't found it yet: maybe it's been hauled off. In 1962 they still had a paper mill here and a railroad, now they have neither. The last railroad was removed in 1990. I couldn't even locate an old railroad depot, except for a Detroit & Mackinac passenger car that was once used as a depot. It has been relocated to Court Street near Young Street, in an area that once was a railroad yard, where it is used as the headquarters of The Straits Area Heritage Society. They also have the beautifully restored Cheboygan Opera House. While it has been here since 1877, it was only restored and re-opened in 1984. It originally housed a combination of City Hall, Police Department, Fire Department and the 582 seat Opera House, the same as it does today. But sometime later, until 1984, City Hall was located elsewhere and this building was vacant. Now you can attend events throughout the year, including concerts, an arts festival and even an occasional real opera! I'm also going to stop and walk out to one of the smallest lighthouses we'll see, the Cheboygan Crib Light. It's on the west breakwater, at the mouth of the Cheboygan River and is only 25 feet tall. It was built in 1884 to mark the City of Cheboygan's water intake crib, and was originally off-shore. It has since been built into the new breakwater. Also, for you boaters, Cheboygan is the start of the Inland Waterway that almost cuts across the penninsula to the west, reaching Conway, Michigan. The 38 mile route follows ancient Native American canoe routes used to avoid the dangerous waters of the Straits of Mackinac. Canals were dug and completion of a 12-foot high lock on the Cheboygan River connected several rivers and lakes. The Inland Waterway was originally used for shipping by the Cheboygan Slack Water Navigation Company, but since dredging in 1957 it serves pleasure craft and fishermen, with 17 species of fish in the rivers and lakes. You could bring your boat, even in 1962, but since I didn't bring a boat I'll have to pass on this side trip. If I weren't going to have a picnic lunch, I could try the Hack-Ma-Tack Inn. The Inn was originally constructed in 1894 by Watson Beebe as a private hunting and fishing lodge. It sits on Mullett Lake, just 5 miles off US-23, with lake views available. You might try locally caught lake trout or walleye for lunch. Or even better would be the Carnation Restaurant, right downtown! My parents ate there on their honeymoon in 1950 and the restaurant has been there since 1926: a real Cheboygan institution. Though we could have visited when I began writing Roadtrip-'62 ™ , it burned down in late 2011. But I'm heading just east of the city to Cheboygan State Park. Besides hiking trails, a campground, and forest and shore, it contains the ruins of the Cheboygan Point Light. This lighthouse was the second one at this spot, built in 1859. It operated until 1930 and then the State of Michigan acquired the land for a public park, so this park was here in 1962. We'll see several lighthouse museums along the way, but this is the only ruins, so it's a good place to get out and take a hike. And, it's also time for that picnic lunch! It’s always a good idea to bring food for picnics on your roadtrip because there are some really beautiful places to sit and watch the world. I've got some great 1962 food: Spam, carrots, Wonder Bread, Kool-Aid, Fritos, and some M&Ms Candiesmm for desert. Originally there were only 6 flavors of Kool-Aid to choose from though, and no such thing as Chili Fritos. And, the carrots were not the ready-to-eat baby-cut carrots I buy all the time now. No, you had to cut up your own large carrots: this is roughing it! After seeing the beach and ruins, it's a beautiful 40 mile drive along the lake again to Rogers City. If you want to enjoy the view some more, there are two roadside parks along the way in 1962, one at Nine Mile Point and another about 5 miles farther. There are 3 more now, but we'll have to disregard those stops as too new. The one at Nine Mile Point has picnic tables, a sandy beach and an old-fashioned hand-operated water pump in case you need to fill water bottles. At 40 Mile Point there is a lighthouse of the same name, that was still operating at least up to 1971. Like so many, today it is a museum and park, but it has something else that has been there since 1962: the pilot house of the lake freighter Calcite. The ship was retired the previous year and this relic has been here for visitors to see ever since. Another nature stop is P. H. Hoeft State Park, which has some very nice hiking through the woods and along the sand dunes and beaches. These are some of the few dunes along the Lake Huron coast, most in Michigan are on Lake Michigan. These are also smaller than Lake Michigan dunes, but still very nice and very different from the beach back at Cheboygan State Park. I'd like to try to squeeze in another hike and still get to Rogers City for dinner, but that's a stretch. The best bet is to choose one or the other of these two parks and stay long enough to really enjoy it. At either one, you might get to see a variety of water fowl, deer, chipmunks, and flowers on the trails here, and you can enjoy the sound of the surf on some days. It's not quite like an ocean though. Because there are no tides, there is only surf when there is a wind. But even though it's not an ocean, it reminds me of some of the great surfing songs. Let's listen to one from 1962 by the Beach Boys as we drive. This was the year they entered the pop music scene, with "Surfin' USA". Let's watch the Beach Boys perform their hit! As we approach Rogers City, Michigan, we'll drive through on Business US-23. This was also Business US-23 back in 1962 and in fact is the route that was once just US-23, before the bypass was built in 1942. This way we get to see town. The first stop is the Presque Isle County Historical Museum. Back in 1962, this building, the Bradley House, was the County Library. We could have stopped in to read a history book about Rogers City, but today we can see some history. It will be our last little history stop of the day. One room houses the Calcite Collection, which is about 42,000 photos of the Calcite Plant mine, buildings, and employees from 1911 through the early 1980's, so we're sure to see something from 1962. After we get a motel, we'll drive out to the mine. The house itself was once the company-owned home of the manager of Michigan Lime's Calcite Plant. Next we should do something about tomorrow's picnic lunch, before the place closes. I wanted to visit Nowicki's Sausage Shop, which in 1979 made it into the Guinness Book of World Records with the longest sausage! However, they moved to Alpena just a few years ago. Fortunately, because I don't want to wait until we get to Alpena, Rogers City has another great meat shop. Plath's Meats has been here since 1913. Nothing says meat better than the giant, pink, paper mache pig in the store window! I'm here for something smoked. They list 24 varieties of sausages, though not all of them were being produced in 1962. They have everything from a potato brat to smoked fish. Or, if you prefer some jerky or something to grill on your way, they have those too. I'm going to try some landjaegers for snacking and some Weisswurst (a German white sausage) for grilling: man cannot live by Spam alone! Well, it's about the end of the day, and time to find a motel. That can sometimes be difficult, as we're restricted to places that existed in 1962. It will require us to cruise up and down the main street, the shoreline streets, the bypass, and maybe out of town a couple of miles. In some cities, we just won't find anyplace worth staying. Tonight we're lucky; there are several to choose from, and in good condition. The North Star Motel has been recently remodeled, so we can have an old motel with modern comforts: the best of both times. Huron Shores and Captain's Quarters also look like possibilities. Restaurants are usually easier. Let's try the Black Bear Cafe, right downtown. They have homemade soups, chili, desserts, and hand-pressed burgers. Carmeuse Quarry, Rogers City, Michigan, looking northeasterly across over one mile of excavation! One last bit of sightseeing for the day after dinner: we're going out to the world's largest open limestone quarry. First we'll take a look at the ships at port, out at Harbor View on Calcite Road. Considering how industry tends to use the same equipment for a long time, this probably looks very similar to what it looked like in 1962. And it's well worth a look, as you can watch the lake freighters being loaded. Harbor View is found off of Third Street and Woodward Avenue and the route is signed. I also want to take a look into the quarry, and there are also a couple of spots where you can do that. One of the best is called Quarry View and you can find it along US-23 just south of town. The quarry is so large that it's on both sides of the road! This has been a limestone quarry since 1914, because it is good quality for concrete and steel-making and has a natural port on Lake Huron right at the foot of the quarry. An entire railroad yard was built around and within the quarry to serve it with land transportation, but the line was removed about 10 years ago. Once owned by U.S. Steel, it is now owned by Carmeuse Lime & Stone. After we're done ooohing and ahhing over the size of the hole, it's time to go back to the motel. See you back on Roadtrip-'62 ™ tomorrow: sleep well!